The Red Wings give Mike Green a $10.75 million, two-year contract. The Detroit Red Wings’ youth movement is on hold after a series of veteran signings. 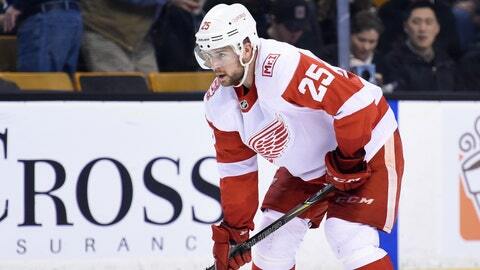 Detroit signed 34-year-old winger Thomas Vanek and 29-year-old goaltender Jonathan Bernier on Sunday and they also re-signed 32-year-old defenseman Mike Green. Vanek signed a $3 million, one-year deal, while Bernier got $3 million per season on a three-year deal. The Red Wings gave Green a $10.75 million, two-year contract to maintain some stability on their power play. He’ll count $5.375 million against the salary cap. Vanek is a player general manager Ken Holland had been interested in for a while. He had 15 points in 19 regular-season games with the Blue Jackets after they acquired him from Vancouver. Bernier became the odd man out in Colorado after the Avalanche traded for Capitals backup goaltender Philipp Grubauer. He’ll get the chance to compete for starts with Jimmy Howard in Detroit.